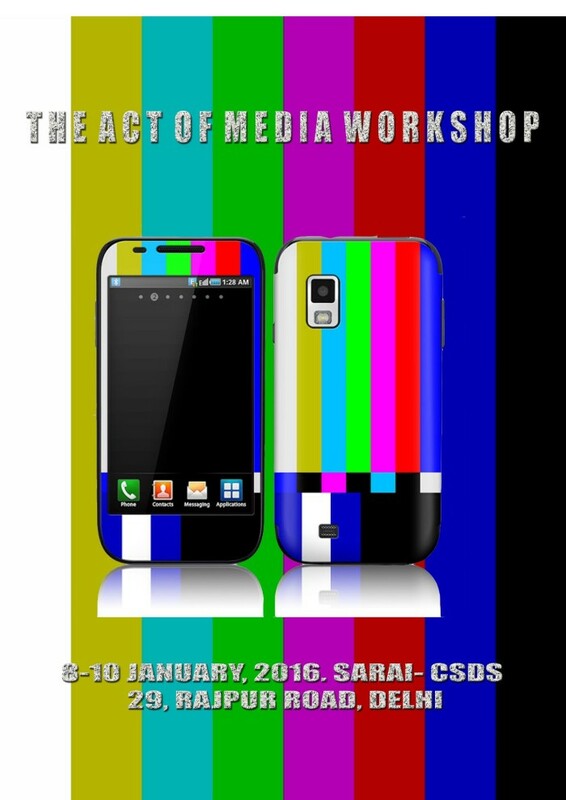 The Sarai Programme, Centre for the Study of Developing Societies is organising The Act of Media workshop on 8th to 10th January 2016. The workshop examines how media-enabled subjectivities produce new sites of departure in the law. The shift from theatre to cinema; cinema to video; and video to satellite television have been productive sites for law’s engagement with technology. The understanding of traditional notions of sovereignty, jurisdiction, and a public sphere defined by rational discourse have been challenged by the contemporary post Web 2.0 moment and the sheer speed, reach and inter-media circulation that this moment has enabled, breaking the bubble sphere of the old Internet. The workshop brings together law and media practitioners, legal and media theorists, scholars from the law and social sciences, media and visual studies and media anthropology. The workshop is a space to throw open and explore new ideas and work in these fields, and engage with ongoing research in this area, while keeping in mind the nuances of legal and media practice. Limited seats are available to attend the workshop. To register, please fill up this form. The schedule for the workshop is listed below. We encourage you to use #ActOfMedia to Tweet about the workshop.